Appalachian Ski Mtn. is Your 1st Resort For Family Fun! Skiing since 1962, the High Country’s 1st ski area is still the mountain of choice for skiers of all ages and abilities. Appalachian is celebrating more than 50 years of great skiing and family fun. SkiNC and SkiSoutheast features more than 500 photos from Appalachian for more than 16 years. You can click the “Photo” TAB above, or scroll down this page for the “Photos from Past Seasons” link! With 10 slopes, 3 terrain parks and a panoramic outdoor ice arena, there is an adventure waiting for every member of the family, even if your idea of adventure is shopping or dining slopeside by a roaring fire. With a season lasting from mid-November to late March, Appalachian also offers night skiing seven nights a week. Of course App is ALWAYS adding improvements to they’re top-rated snowmaking system. They are also the top-rated. family-friendly ski resort in the region! After just ONE VISIT we know that you will quickly agree! Looking for a GREAT Wedding Venue? Well, ASM provides a unique and scenic location in the Boone / Blowing Rock area for your High Country Wedding! The Catering Department is always available to aid you in the planning of your event. They offer many complimentary services, such as assistance in locating florists, bakers, musicians, rental equipment, and more. Appalachian also offers chairlift service for Wedding ceremonies as well as convenient on-site mountainside lodging. We know that planning an event takes a lot of time and they want to facilitate your needs in every possible way. Click here to see more information about weddings at Appalachian Ski Mountain! 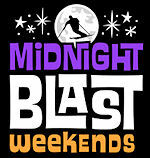 Late night skiing is back for the High Country!! Night skiing has been extended this year, with the night session kicking off at 5:30!! The usual 5:30 to 10 pm hours will be extended to midnight on these special weekends. Best of all, these extended hours will be offered at no additional cost. “With challenging economic times, people looking for a good value will discover that this is the best ticket value that we offer, at a time that is actually convenient,” said Appalachian Ski Mtn. General Manager Brad Moretz. Appalachian is the only ski area in the Southeast region to offer late-night skiing. 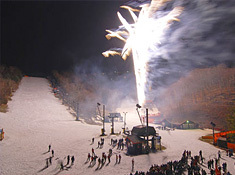 Call for customized Ski-and-Stay packages, and don’t miss special events like the New Year’s Eve Fireworks Extravaganza and Closing Day Pond Skimming and Costume Contest! “Appalachian Ski Mtn. will offer new riders the type of top-quality experience and excellence in instruction that Burton looks for in its Learn To Ride Centers” said Jeff Boliba, Burton Snowboards’ Global Resort Director. Appalachian Ski Mtn’s Alpine Ski Shop is an authorized Burton dealer and carries men, women, and children’s snowboard equipment, clothing, helmets, and accessories. 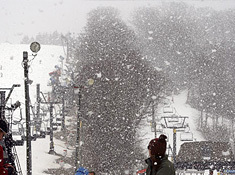 After adding to their snowmaking arsenal prior to the 2007 season, Appalachian was able to create a blizzard across the entire mountain every time they cranked up all of the snowmaking mechanisms! 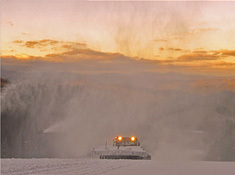 Improvements in their snowmaking plant allowed App to make snow and remain open with some of the best conditions of any year on record. 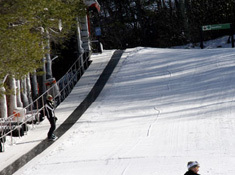 Appalachian Ski Mountain has long been acclaimed as one of the best places to ski for families, groups and beginners. 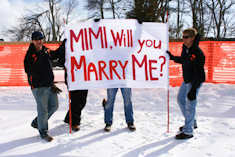 They welcome skiers and snowboarders of all skill levels. Appalachian Ski Mountain also boasts a beautiful ice skating rink. You will now find eleven slopes and five lifts that include 2 quads and 1 double chair and a conveyor belt which is designed to take beginners to the top of the beginner terrain! Prices as low as $65 to $112 per night for ski and stay packages. Appalachian Ski Mountain offers convenient slopeside lodging. All offer fully equipped kitchens with microwave, gas fireplace, washer/dryer, phone and remote control color TV with VCR; two homes with direct access to slopes, one is two minutes walk from Appalachian Ski Mtn., one overlooks the slopes and is 1 mile from the gatehouse. Call 800-322-2373 for details and rates.